Along the top, from left, Taylor D’Elia, Angela Petrangelo, Jordan D’Elia, and Andrea Petrangelo, soared during the Revere Patriots’ opening stunt at the Cheer Ltd. Nationals. After a pep talk and circling up to break on the word “family,” the Revere High School varsity cheerleaders won the national title in the medium varsity division at the Cheer Ltd. Nationals tournament in Myrtle Beach, S.C. The win on March 17 came after the team was undefeated during fall competitions at the state level. Coach Julianne Esposito said the Patriots’ last national cheerleading win was in 2005. Dressed in their red, white, and blue Patriots uniforms, the group of 16, which includes one male, performed a two-minute-and-30-second routine for the judges. Esposito said that most of the team, ages 14 to 18, trains year-round in preparation for competition season with practices that start in August and continue throughout the school year for at least two hours a day. The team also performs during games on weekends, and some members attend cheer camp in the summer. “They had to stay prepared for that long,” said Esposito, who cheered at Revere High herself. One of the team’s captains, Kylie Mazza, 18, said practices are long and intense, especially since the squad had to change 25 percent of its routine a week in advance to adapt to national competition standards. Esposito said that in addition to raising more than $14,000 to get to the national competition, which they collected through fund-raising and donations from North Shore businesses, the biggest challenge was keeping the team motivated during every practice. “It was hard to keep their attention, keep their eye on the goal,” she said. Despite some motivational setbacks, she said, the team was extremely committed to success. Mazza said the Patriots felt confident after a first round of competition on March 16 earned them a second-place ranking. According to Mazza, the Patriots’ flair is what set them apart in the competition. Esposito said the Patriots also stood out from their competition with the storytelling element in their performances. 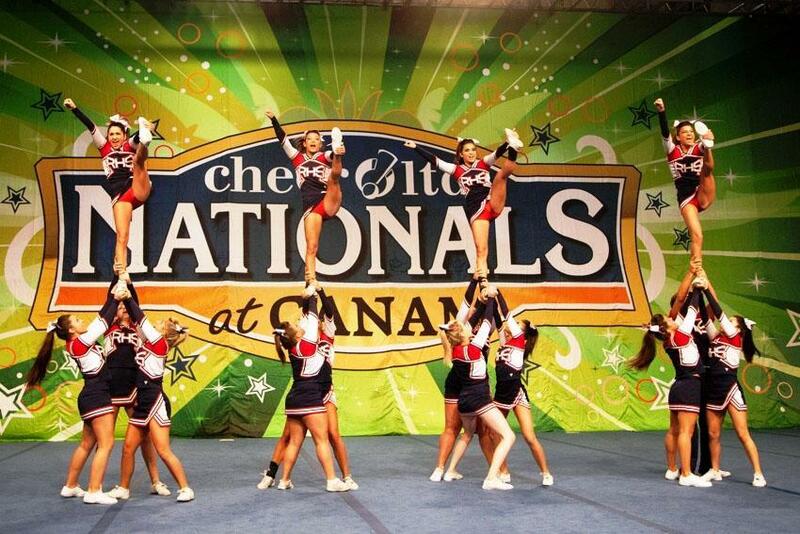 After completing their routine a second time on Sunday, the cheerleaders were awarded their national champion title. Squad members earned navy-and-silver jackets and medals that they wore to school upon their return. Mazza said the group is overwhelmingly supportive of each other.